Last week’s election news gave rise to emotional swirls and storms that left some of us searching for solid ground amid the chaos of opposing perspectives. 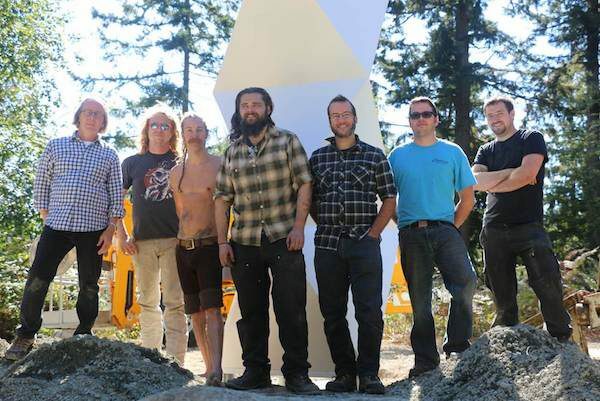 Perhaps one way to make sense of the shadow and light within our country is by visiting the Infinite Tower, unveiled at the Earth Sanctuary late last month. 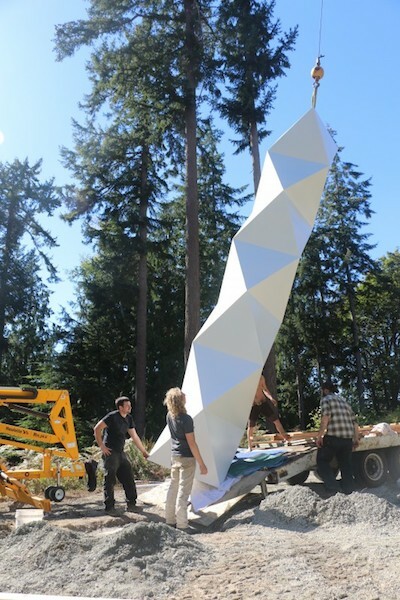 The newest addition to the 72-acre Buddhist-inspired nature reserve and sculpture garden is a modern sculpture similar in shape to an obelisk, only one containing triangle-shaped facets. 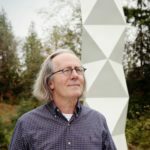 Pettis worked with Matthew Swett of Taproot Architects to create a blueprint detailing a 24-foot column of interlocking equilateral triangles that create a deceptively fluid visual effect. Metal artist Tim Leonard of Heavy Metal Works fabricated and built the tower, which includes an interior mast for strength. 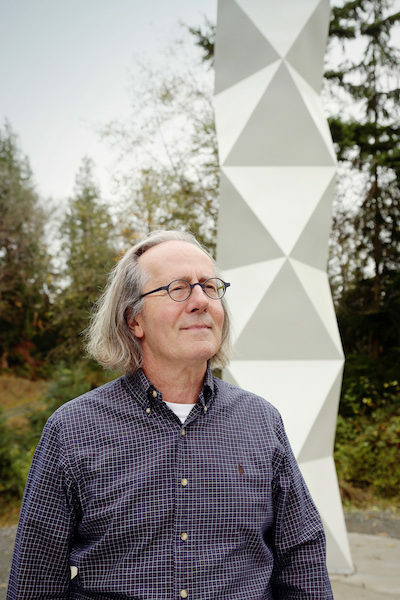 Pettis said the symbolism within the design includes: creating a connection between earth and sky; white as the color of clarity and purity (which reflects shadows and shapes on the sculpture); honoring the nearby trees and snags, which join the earth and sky; and incorporating the number eight (eight triangles in each octahedron) and the number seven (seven stacked octahedrons), which, in numerology, symbolizes harmony and spirituality. “I like what they did at Storm King and thought, ‘What could I do on a small scale?’” says Pettis. On a September afternoon, when a towering crane lowered the 25-foot tower into place, Pettis, Swett, Leonard, and the crew grinned like boys having their ultimate adventure. Freeland novelist and artist Fred Bixby, who is a legally blind, visited the tower that same afternoon. Swett’s wife, Sarah Birger, who was there for the tower’s installation, guided him to the sculpture where he could touch it with his hands. Chuck Pettis’ intention for the Earth Sanctuary is that it inspire a sense of well-being and spiritual uplift for years to come. To this end, he has created a 500-year trust that ensures the sustainability of the property. To date, more than 3,000 trees and 15,000 kinds of vegetation have been planted that are expected to last through our earth’s climate change into the year 2500. He imagines the sculptures will last at least that long, too. Kate Poss worked as a library assistant at the Langley Library until last June. She was thrilled to work for three summers as a chef aboard a small Alaskan tour boat from 2008 to 2010. She was a newspaper reporter in Los Angeles for many years before moving to Whidbey Island where she likes “talking story,’” hiking, hosting salons, and writing her novel. The sculpture is a changeling that seems to possess the power to expand and collapse, depending on where you stand, how close or how far. 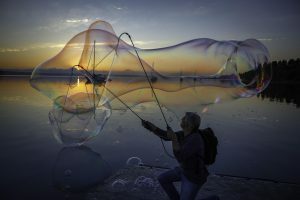 It is both gentle and strong, a lovely vision made real by a great team of people.